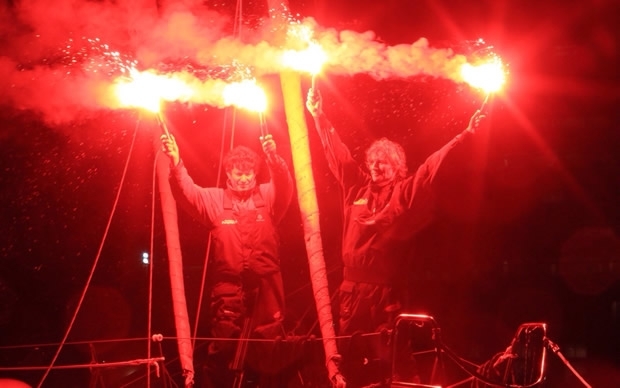 Vastly experienced offshore racers, Switzerland's Bernard Stamm and France's Jean le Cam on board Cheminées Poujoulat have won the Barcelona World Race 2014-15 and set the reference time for the doublehanded round the world race of 84 days, 5 hours, 50 minutes and 25 seconds for the 23,321.76 miles for the theoretical course. Stamm, 51, and le Cam, 55, sailed to victory today, winning the third Barcelona World Race, crossing the finish line at 17:50:25 UTC in a 10-15 knots southeasterly and smooth seas. Their average speed for the course is 11.53 knots, although their actual distance over ground is 27,950 miles, which represents an average speed of 13.82 knots. Stamm and le Cam have established the reference time for the race, which followed a different course this time: from Barcelona to Barcelona, passing all three great capes Good Hope, Leeuwin and Horn, leaving Antarctica to starboard. But for the first time the course went direct under New Zealand rather than diverting north to pass through Cook Strait between North and South Island. This reduced the course distance by about 1280 miles compared with previous races. Stamm is a happy man this evening. Just before Christmas 2013 - in fact during the night between 23rd and 24th December, he had to be rescued after his IMOCA 60 completely snapped in two in force 9 winds and 10 metre waves when he was delivering his boat back to Brest from Brazil after racing in the Transat Jacques Vabre. Stamm made global headlines, describing later how he knew that in order to survive he had to take to the icy waters of the Western Approaches 170 miles from the Scilly Isles to "swim for my life". A year later he started this round the world race, and now, today Stamm has achieved his third victory in a shorthanded round the world race, the first one non-stop and doublehanded, following the Around Alone in 2002-3 and again in 2006/07, the race on that occasion renamed the Velux 5 Oceans. Theirs has proven a remarkable partnership of close equals, a pair who have delivered victory thanks to their many, many years of experience, good and bad. They had never sailed together doublehanded before this race, but had both achieved notable successes, racing doublehanded. With his latest success Jean Le Cam is also winner of the 2013-2014 IMOCA Ocean Masters World Championship, while Stamm is runner up. In this his fifth round the world race, Le Cam, known by some in his native France as 'Le Roi Jean' (King Jean), adds his first ever outright victory in a round the world race to an extensive ocean racing record which stretches back 31 years, including second in the solo Vendée Globe in 2004-5 behind Vincent Riou. In fact, now after winning 2013's Transat Jacques Vabre to Brazil with Riou, Le Cam has won the two biggest IMOCA doublehanded races back to back. Le Cam, like Stamm, has also cheated death on the ocean, rescued by Riou from his capsized IMOCA 60, 200 miles from Cape Horn during the Vendée Globe 2008-9. He is also one of the very few skippers to win La Solitaire du Figaro three times. The IMOCA 60 Cheminées Poujoulat is a monohull designed by the Farr Yacht Design, launched in 2007. With it, as Foncia Michel Desjoyeaux won the Vendée Globe 2008/09 in an elapsed time of 84 days, 3 hours and 9 minutes. Stamm and Le Cam have made a very similar time including two Gibraltar Straits crossings and two Mediterranean legs. In the Barcelona World Race 2010/2011, this IMOCA 60 was second with Spain's Íker Martínez and Xabi Fernandez as co-skippers. It made the start of Vendée Globe 2012/2013 with Jérémie Beyou as Maitre CoQ. The boat has been modified several times to adjust to the IMOCA class' rules evolution and improve its performance in big waves. With two victories and a second place in round the world races, this boat has become a legend of the IMOCA class. Cheminées Poujoulat took the leader of the Barcelona World Race on 17 January, when they overtook Guillermo Altadill and José Muñoz on Neutrogena in an intense head to head battle, off Rio de Janeiro. Before Neutrogena, Alex Thomson and Pepe Ribes had led the race until their Hugo Boss dismasted on 14 January. Stamm and Le Cam's rivalry with Neutrogena went on until Altadill and Muñoz had to stop for 24 hours in Bluff, New Zealand on 12 February to repair their generator. The arrivals of provisional second and third, Neutrogena and GAES Centros Auditivos, is expected between 30 March and 2 April.